For the purposes of Drinking Water Source Protection, the Mattagami Region Source Protection Area (MRSP) Area consists of the Upper Mattagami River and its tributaries upstream of the Lower Sturgeon Generating Station and a portion of the Abitibi (Porcupine/ Nighthawk/ Frederickhouse) River system. Both the Shaw Wellfield and the Gogama Wellfield are included in the Source Protection Area. The Upper Mattagami drainage basin is comprised of five main river systems: the Mattagami River, Grassy River, Tatachikapika River, Kamiskotia River and the Mountjoy River. There are also five control facilities on the Upper Mattagami River. The easterly portion of the Source Protection Area encompasses part of the Abitibi/Frederickhouse River system and makes up about 25% of the MRSP Area. 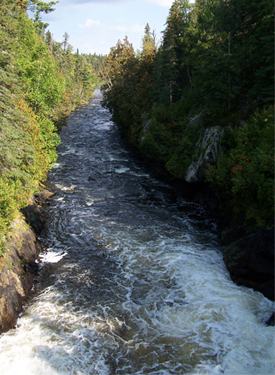 The main tributaries are the Redstone, Nighthawk and Porcupine Rivers. The Mattagami Region Source Protection Area includes the City of Timmins. Smaller communities are located at Gogama, Westree and the Mattagami First Nation Reserve. The City of Timmins, which covers the northerly portion of the MRSP Area, consists of Mountjoy, Timmins, Schumacher, South Porcupine and Porcupine as well as the outlying communities of Kamiskotia Lake, Hoyle and Connaught. In addition to these urban centres there are several industrial sites associated with the mining and forestry sectors. Mine tailings ponds, sand and gravel pits and forest harvest sites are the main features on the landscape that have an impact on the area’s water resources. With a population of approximately 45,000 the City of Timmins is a major regional centre for Northeastern Ontario providing a wide-variety of institutional, commercial and industrial services.